No need to go overboard when doing your seasonal decorating! 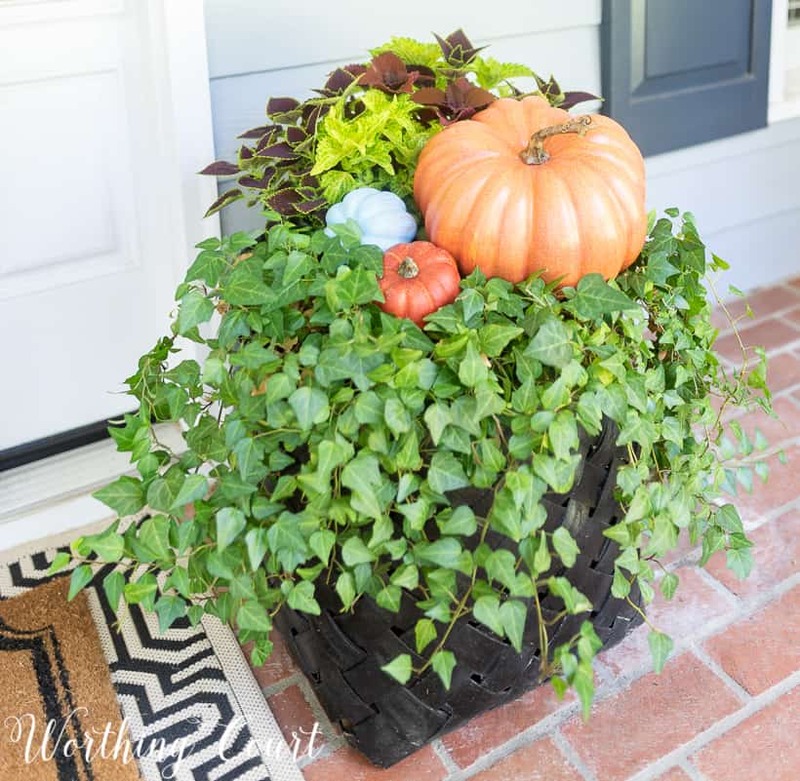 Check out these simple ideas for adding just enough fall decor to your front porch. We’ve been slowly working on the curb appeal of our home ever since we had the red brick painted a couple of years ago. 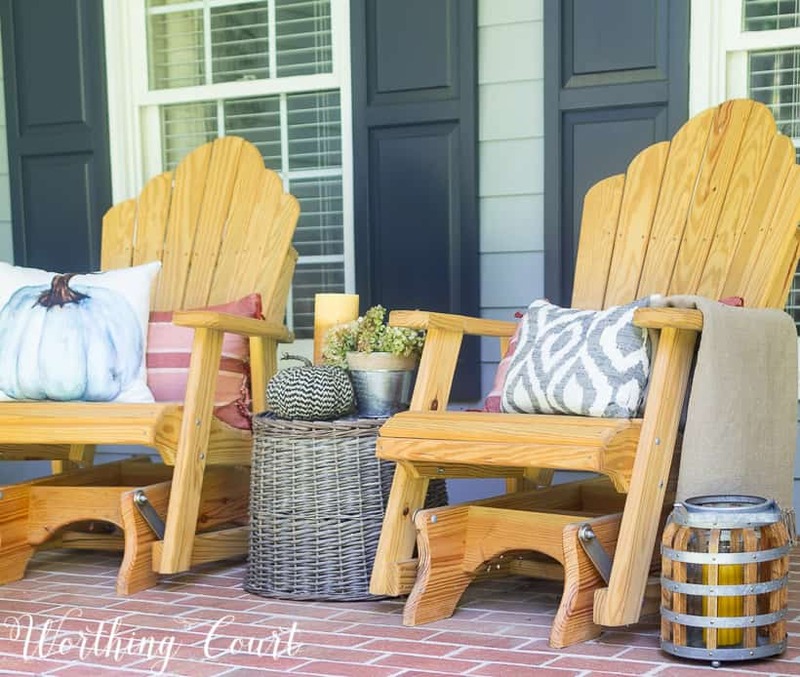 One of my favorites additions to the porch are four wonderful wooden Adirondack gliders! 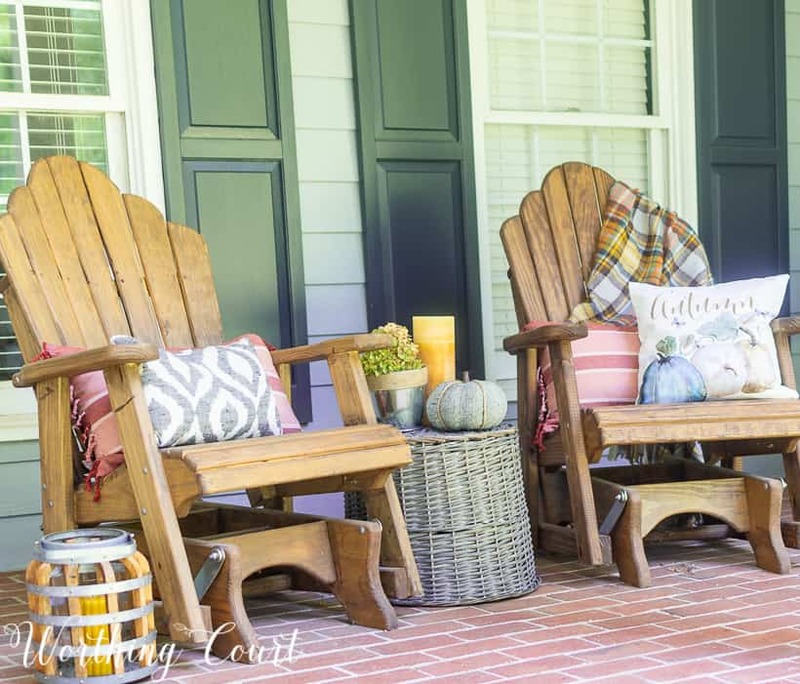 Our front porch is made for sitting and we love, love, love to enjoy a cup of coffee out here on cool fall afternoons. The fun braided tassel, striped pillows were a happy find a few weeks ago! 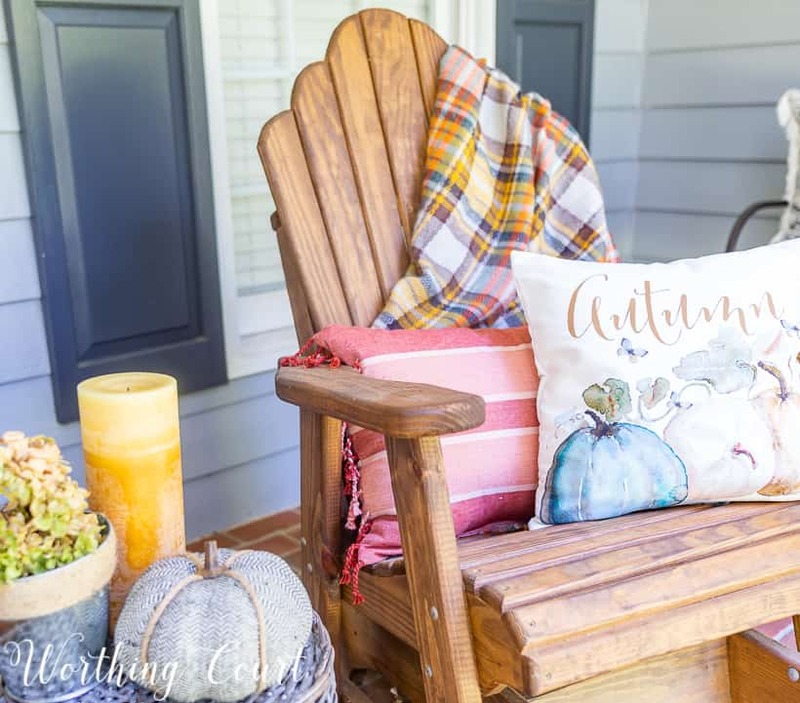 Paired with a fall plaid blanket scarf and pumpkin pillow covers, my front porch is an introduction to all the colors to be found on the inside of my home this season. In keeping with my K-I-S-S decorating philosophy, have two baskets, that I turned into planters, that always flank my front door. The baskets were originally white, but I spray painted them black for a classic look. To keep the baskets from rotting, I added a large plastic container inside each basket that holds the actual dirt and plants. So far, they’ve held up great! GET DIRECTIONS FOR HOW TO MAKE THIS WREATH HERE. The ivy spilling over the sides stays put year round and I simply change out the other plants, depending upon the season. This fall, I added colorful coleus and tucked a few pumpkins into the ivy. My symmetry loving self has two gliders, a small table and a bench on each end of the porch. We’ve managed to stain two of the gliders, but still have two more left to do. Hopefully, that will happen this fall! Here’s a money saving tip: instead of purchasing actual tables, use a large basket turned upside down! The basket makes a super table and you can even add a round wooden topper, from your local home improvement store, to make the surface completely flat. 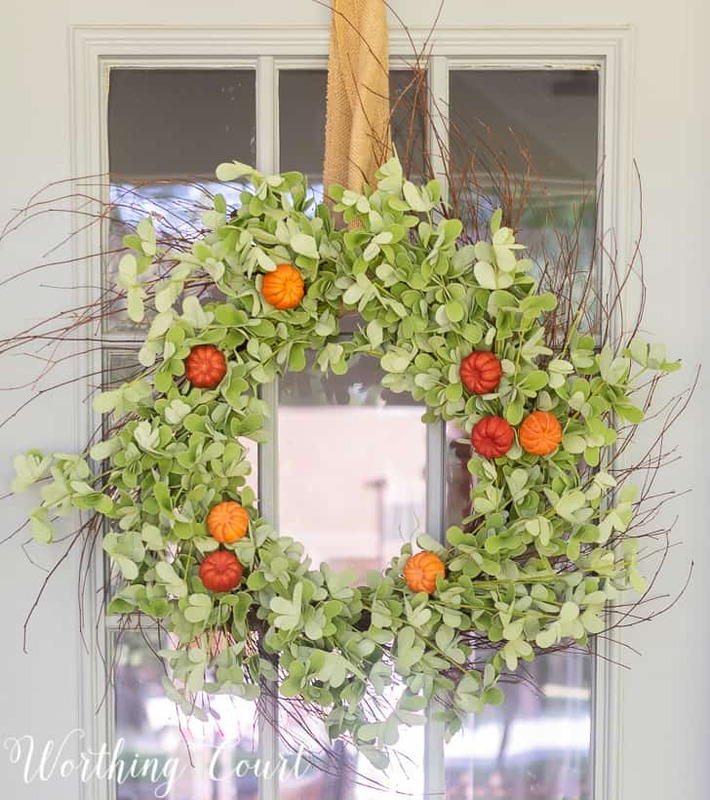 The wreath on the front door is a new one that I made using faux eucalyptus and some tiny pumpkins. I’ll be back later this week to show you how I made it! 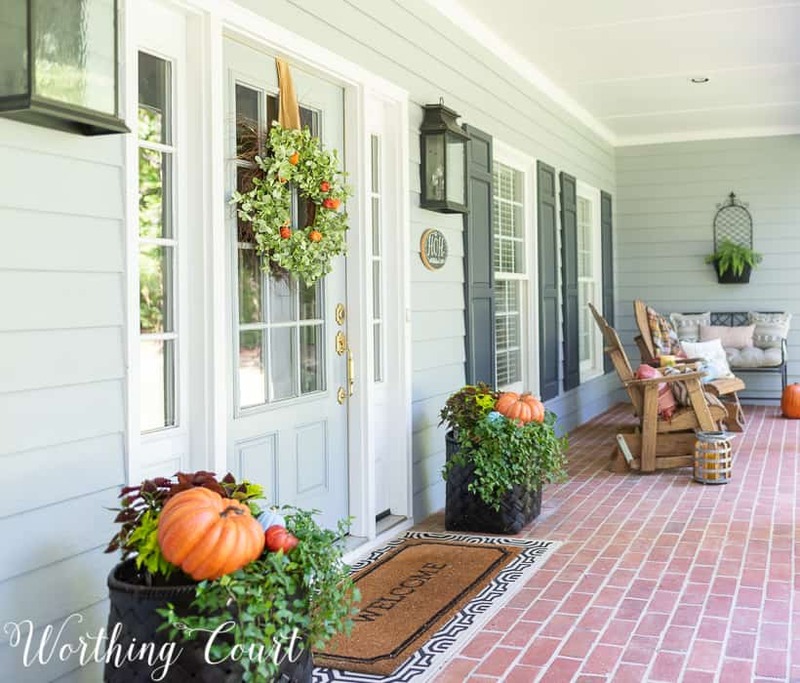 Happy fall – from my front porch to yours! That’s very pretty, Suzy! 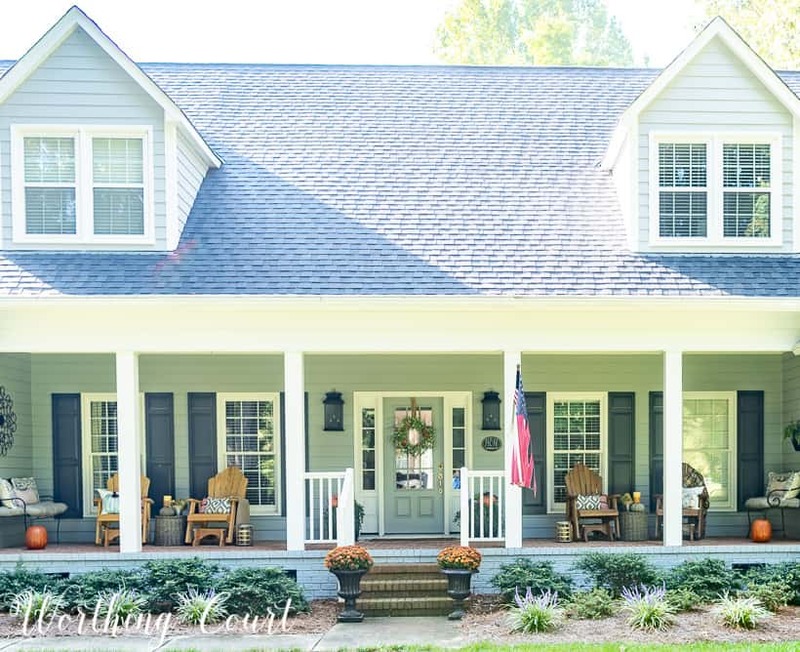 But because your porch is so big, it still looks like a lot of work! Thank you, Rita! Actually it wasn’t bad at all because the chairs and most everything else stay out there all the time. Now – what I did a couple of years ago? That was a LOT of work! 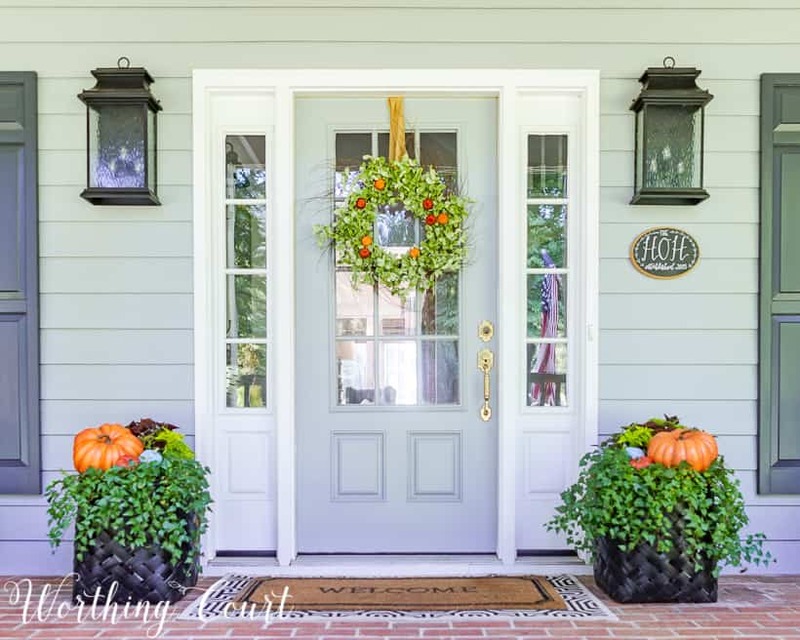 Love your porch!Love the wreath!Can’t wait to see how you made it! Thank you, Ellen! I published a tutorial for the wreath, so let me know if you have any questions! Hello Suzy and Happy Fall! 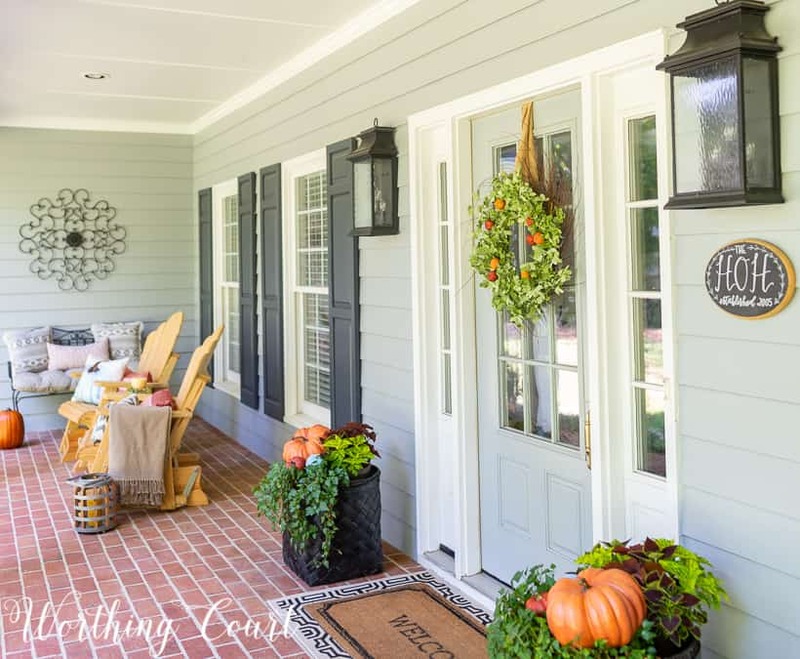 Your front porch is a real treat to someone like me who has never ever had a front porch! How fun it would be to decorate everything the way you have! It’s so festive and welcoming! The plaid throws are lovely and the basket as a table between your chairs is fabulous!! Great idea! The coleus you added to the ivy got my full attention as it’s one of my favorite plants and the wreath on your front door completes the look! You are so, so sweet, Lucy. Thank you! It’s Just Enough! I think it is perfect! Praying your beach place is ok. What a terrible storm. Thank you, Pam! It was a terrible hurricane and a disaster of epic proportions for so many in eastern North and South Carolina. We’ve been told (but haven’t seen for ourselves yet) that there’s no damage to the interior of the condo. We don’t know if the a/c survived or not. SO thankful and thank you for your prayers! We were supposed to go to N. Topsoil for our annual family vacation but if course that was cancelled due to Florence. Hope everything is well with your new beach house. The damage along the path of this storm was tragic. Hope to get down there later on to help with cleanup. Your porch is lovely. I used the rainy days to do some inside decorating. Definitely need to purge my fall bins! Trying to keep your advice to keep it simple. I’m so sorry you missed your vacation at N. Topsail! Just fyi – the government officials have said no rentals on the island until further notice, so hope you can find a place to stay if you make it down there! There’s a brand new Hampton Inn in Sneads Ferry you might want to check out to see if they’re open. You’re right – the damage is tragic, but I’m so thankful the hurricane didn’t come in as a category 3 or 4 as was first predicted! Where in the world did you find gliders that are Adirondack chairs? I love those! Your porch is absolutely beautiful!